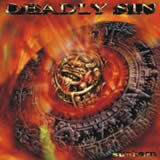 Once an independent band that released three demos from 1998 to 2001, Germany's Deadly Sin finally landed a deal with Spiritual Beast and released this Japanese only CD, called Sunborn. Featuring a quality blend of Progressive Metal and Melodic Power Metal, Sunborn is a fine full-length debut. After the obligatory intro, the CD begins with The Awakening. It’s a good taste of things to come as we can begin to hear the slight progressive elements with the large amount of change ups early on. Everything that trademarks Deadly Sin’s style can be heard in The Awakening; heavy riffing, melodic leads, Power Metal quality choruses, subtle keyboards, and strong vocals. Every aspect comes together nicely and the band does quite a few things very well. The guitars do a nice job of coating the songs with melody, aggression, and atmosphere depending on which style Deadly Sin decide to employ. The heavy riffing shows up often and can be considered similar to Pagan’s Mind and even some bands like Poisonblack or Charon during the mid-paced sections. I know that sounds odd, but the whole style of production and some riff progression is almost done in that style of Gothic/Doom Metal. More traditional Prog/Power riffing is used of course but the Gothic/Doom Metal riffing is an interesting addition. Melodic leads litter the CD as well, as they show up quite often and never go overboard or steal the show. Instead, the leads provide a welcome melodic aspect that fits well with the heavier style of riffing. Most appealing is Deadly Sun’s ability to play more low-key progressive Metal and also more aggressive Metal that you never really expect to make an appearance but does. Thus, there’s a lot of head banging potential and the instrumental Starlight even has a riff that sounds suspiciously like the beginning of Narcosynthesis from Nevermore. Meanwhile the vocals from Ross Thompson are very good. He doesn’t have a typical Power/Prog voice and while he does have a good range and can sing high, he usually opts for more of a mid-range style that is sung with a lot of feeling. While the style has been heard before it is somewhat unconventional for a band like this and fits perfectly with the more aggressive side of the band. Also of note is the quality of the choruses. Every song has a really good chorus and they are usually done in more of a traditional Power Metal vein. I’ve honestly had a lot of choruses from this release stuck in my head for a while, especially the one found in The Raven And The Mirror, which is catchy beyond belief. I’ve rarely heard choruses this good in a Prog/Power band and the vocals in the verses, pre-choruses, and what not are equally impressive most of the time. The vocals really help carry the band and never hold back the music, which is most important. The production is very clean, as to be expected from a band like this and it fits, obviously, but it doesn’t sound all that different from most other bands in the style. Thankfully, since the music is dynamic and occasionally unconventional it does make up for the somewhat conventional production job. The CD does sound professional though, both from a song writing, performance, and production stand point which is important for a band just coming from the Independent circle. Personally, I really enjoyed Sunborn. The catchiness of each song made the CD stay in my player longer than most stuff I review and the dynamic aspect of the song writing is what puts Sunborn above most other releases in the genre. The guitars are always doing something different and Deadly Sin have managed to combine some heavy and aggressive aspects of the genre without ever compromising their melodic or atmospheric tendencies. Sunborn is just one of those releases that you know is not ground breaking or legendary but anytime you put it in your player or hear a song from it you have a great time listening to it. Recommended to fans of Melodic Power Metal with a touch of heavy Prog.